Andy enjoys spending time with his wife and his two very unique cats. He is our city boy turned outdoors man. He has always enjoyed the outdoors and even attained Eagle Scout but he always lived in the city. 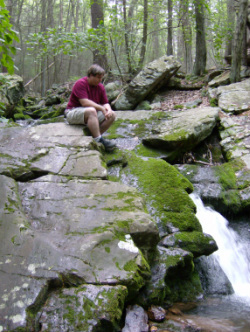 His love for the outdoors let his wife have an easy job of convincing him to move out of Philadelphia and into the mountains. Andy is also our amazing team chef; he is an epicurean soul and we reap the delicious benefits! He keeps the team and our clients smiling with his sharp wit and sense of humor. You learn something in almost every conversation with him as he is a well of worldly knowledge and is always happy to share. He loves books especially about history and we've come to believe his natural state is "reading." He is a solid investigator with years of experience on his own that he brings to the group. Facebook: NightWatch Paranormal - stop by and "Like" our page!